If you don’t know me personally, then I must tell you I’ve been known in some parts as the condiment queen. I adore most condiments, but not their plastic packaging , high sugar content and weird filler ingredients. I made it a mission some months ago to try and reduce as much plastic as possible in my life, including in the pantry and refrigerator. It is almost impossible to get plastic totally out of your life, it is so omnipresent in everything, but try I must as we are all so toxic with BPA. Thus I decided from now on I shall buy no more ketchup in plastic containers. 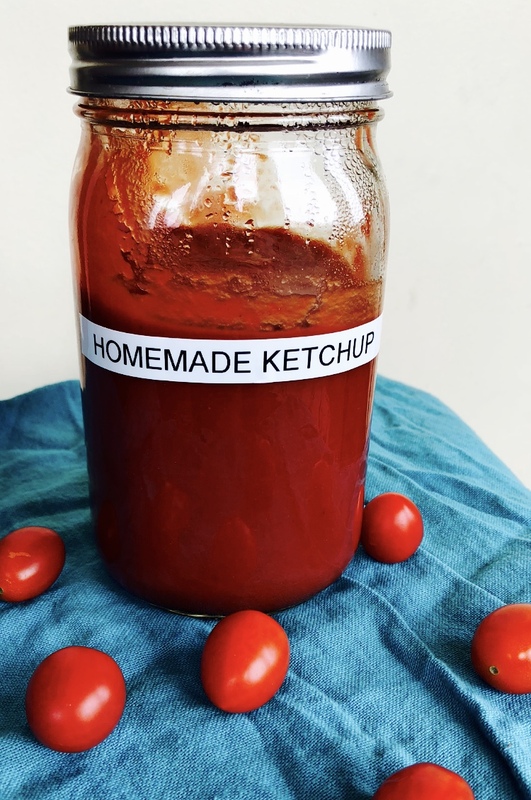 This recipe is so fast, easy and tasty it also yields way more ketchup for your dollars. It has the stamp of approval from my family and friends. Throw all the ingredients into a saucepan on the stove and cook on medium heat while whisking until desired thickness. I usually cook it for 10-15 minutes. Pour into a glass jar and store in the refrigerator. 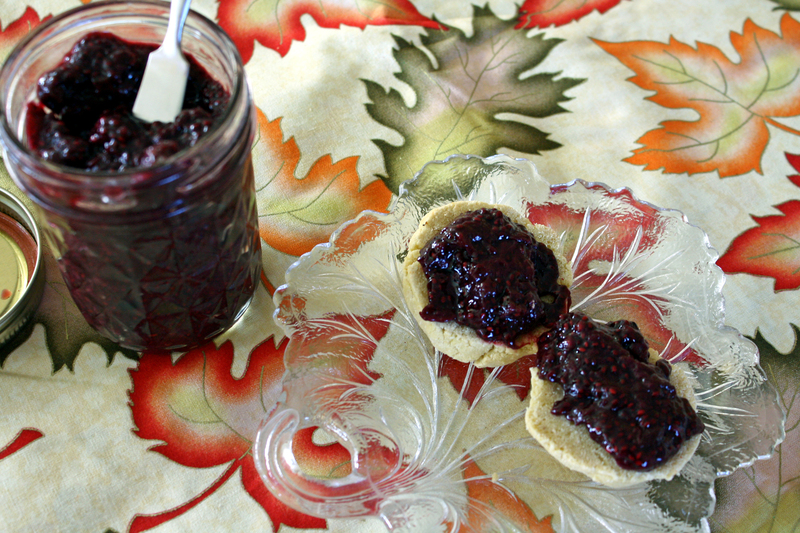 Since my consumption of bread products has decreased to almost nil, I haven’t had much interest in jam. But the other day my dear friend turned me onto this delicious simple recipe she found in a cookbook she had newly acquired. It is a vegan cookbook called ‘The Oh She Glows Cookbook’, there is also a blog by the same name. You can check out the cookbook and blog HERE. When my friend first told me about the cookbook, I was a bit skeptical as it was it was vegan, and as you know I am a bona fide meat grower, hoarder, and eater. Alas another lesson learned to keep the mind open and explore territories outside of your own realm. She gave me a jar of this jam and it was devoured in one sitting. It is fast and easy to make, very low in sweetener and has good for your chia seeds in it to boot!!! The rolls in the picture above are gluten-free yeast rolls made with Otto’s Cassava flour, I found the recipe on the Paleo Mom website. Place Berries and sweetener in a saucepan on stove and bring to a simmer on med to medium high heat. Simmer and stir until berries begin to soften and mash with a fork. Add the chia seeds and continue to simmer until the jam gets to your desired thickness. Remove from the heat and stir in the vanilla. Ladle into a glass jelly jar and store in the fridge. Enjoy on pancakes or ice cream or gluten-free bread products or straight out of the jar! I’m baaaaack! Once again sorry for such a long pause in my posting. I had a goal to post once a week and I seem to be falling a wee bit short of that goal of late. Alas the kids are back in school, and this past weekend, I spent the whole weekend cleaning and getting caught up from a summer of guests and fun. The cleanliness of my house did suffer a bit from the summer mayhem, but time spent with family and friends far outweighs a clean house in my book. We are now hitting my favorite time of year here in Montana, Indian summer, things slow down a bit, my hoarding instincts kick into full power, and the nights are cooler and longer. I have been eating lots of salmon and fish lately, and wanted to share with you this little gem I found to slather just about any type of fish or vegetable in to make it taste even more divine than it is. This recipe is from over at Epicurious HERE. I have only slightly tweaked the amount of salt in this Lime Butter recipe. 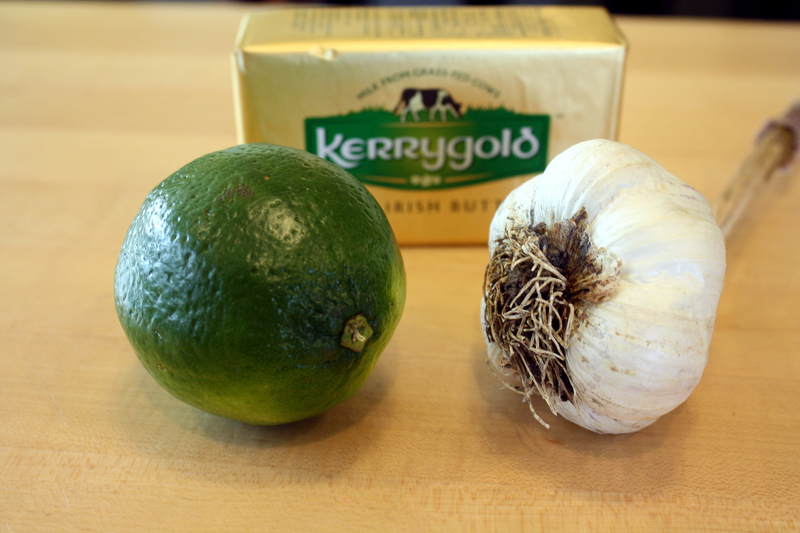 If you know me you know, I love Kerrygold butter, so if you can get your paws on the stuff I recommend it for this sauce. 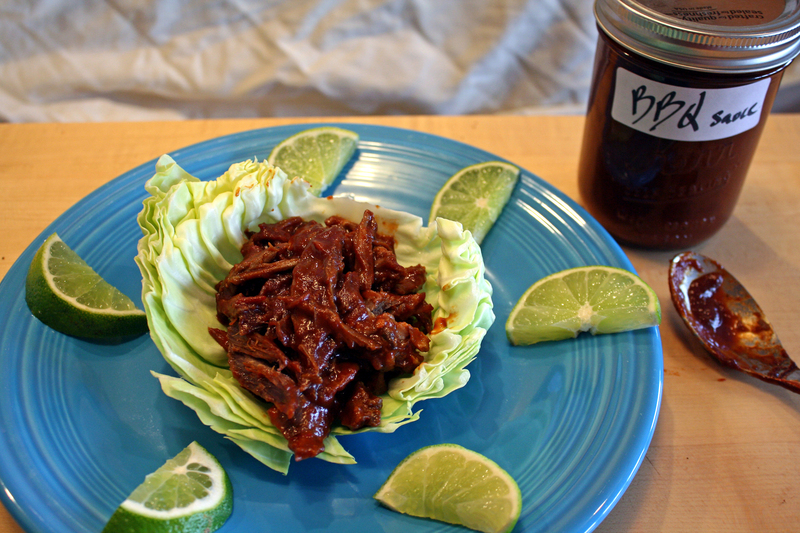 Oh, it is so quick and easy to make too….BONUS! Enjoy it on fish or vegetables and let me know what you think! Place all but the butter into a blender and blend for about a minute. Slowly drizzle the melted butter into the blender while on low to incorporate blend on medium speed for about 30 seconds. Drizzle on Salmon, Mahi Mahi, or Vegetables! Makes about 3/4 of a cup! Store the extra in the fridge it will last for weeks. So my new thing for January was to make head cheese, definitely something I have never tried before and out of my comfort zone. I purchased a piglet last summer and paid monthly for the farm to raise it, (pastured on non-GMO Montana raised grains and fresh raw milk). When it was time to butcher it, I got to choose my cuts, and as I am trying to be a nose to tail eater, I had them include the head. Head cheese actually has nothing to do with cheese. You basically boil the whole head, pick the meat off of it, reduce the broth, and pour it over the layered meat to make a pig head meat Jello, YUM right? Check out the recipes for head cheese HERE and HERE. Well I boiled the head, much to the complaining of my family and I picked the meat off, but as I pondered the head cheese, I realized I would be the only person eating it. One can only eat so much head cheese. The meat is actually quite tasty, so I decided to make some barbecue sauce and go a pulled pork route instead. I continued to reduce the broth and made a homemade bouillon that I can use in sauces and soups. I followed the recipe HERE for homemade bouillon. So even if I didn’t actually make and eat the head cheese, I did take the steps to do it and learned a few things along the way. Here’s to trying new things!!!! Reduce the heat and simmer until the sauce is reduced by about 1/3 (so it is thick enough to stick to the back of a spoon). Store in a glass container in the refrigerator. Enjoy! Growing up with ten siblings I have been called a lot of things, but one name that does ring true is Condiment Queen (and of course my self given title of Miss Beautiful Princess). I find things like burgers and sandwiches to be mere vehicles for mayonnaise, one of my very favorite condiments. I love it so much I bring it with me to friend’s houses or I make it at their house if the meal calls for it. When I started the Paleo/whole food journey, I realized all the store bought mayo contained vegetable aka seed oil,s and that my friends is no good for you. So I decided not to give up the mayo, but to make my own. It is sooo easy and delicious. If you change only one thing in your diet, make an oil/fat change. Read more about how bad things like canola, vegetable and other seed oils are HERE and HERE. Your body will thank you for it. LONG LIVE GOOD FAT! Place your egg yolks, vinegar, mustard, honey, salt and pepper into a blender. Turn the blender on low and take the little top off (you know the one that lets you add things without getting totally splattered). Slowly drizzle the oil into the yolk mixture the stream is like a pencil point thickness it may be messy at first but be patient the oil will slowly emulsify into the yolks and the blender will stop spinning and just make a sucking sound as the mayo sets up. This is where the amount of oil will vary depending on how big your yolks were and the type of blender you use. I just pour out of the bottle without measuring as it is very obvious when the mayo is done. It will be thick and no longer mix in the oil. Store in a glass container and refrigerate mine will usually last a week or longer. 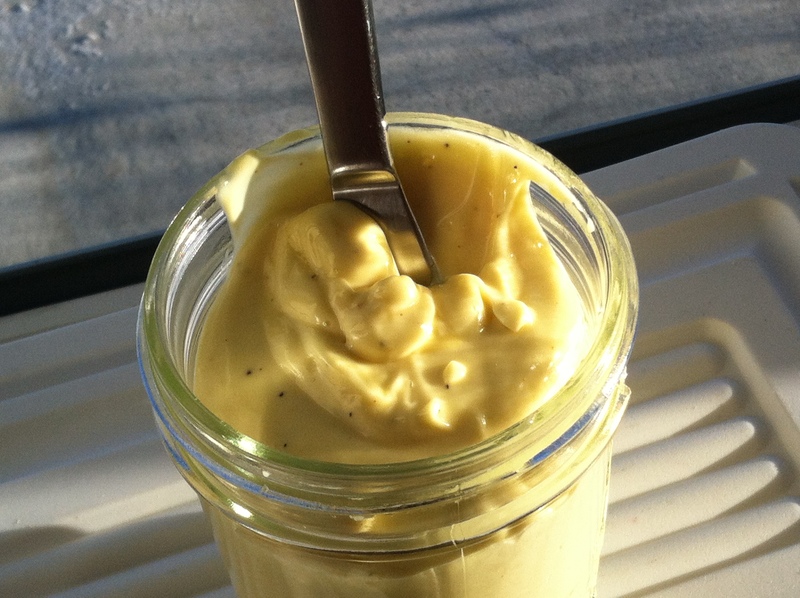 You can flavor your Mayonnnaise with herbs or garlic and use lemon juice instead of vinegar for tasty variations.